A month after launching its subscription-based Office 365 Home Premium for individuals, Microsoft today launched a major update to Office 365 for business users. Just like in its previous incarnation, Office 365 for Business will feature cloud-based online versions of Exchange, SharePoint and Lync, as well as all of the standard Office web applications like Word, Excel, PowerPoint and OneNote (and InfoPath, Access, Active Directory integration and other tools, depending on the version you subscribe to). Starting with today’s update, Microsoft will also offer a set of new versions of Office for small and midsize businesses. In addition, Microsoft now offers the Office 365 ProPlus package, which offers business users the full versions of the standard Office apps as a service for up to five devices at $144 per user per year (including a set of management tools for IT departments). The number of small- and medium-sized businesses using Office 365 has grown by 150 percent in the past 12 months. The new ProPlus packages is also included in Microsoft’s Office 365 Enterprise offerings and the new Office 365 Midsize Business package. This new Midsize Business version is meant for businesses with between ten and 250 employees. As Microsoft’s general manager for its Office Division Kirk Gregerson told me earlier this week, most of these businesses don’t always have IT departments and if they do, they typically only have an IT generalist on staff. Because of this, the Midsize Business edition comes with simplified IT tools that take away a great deal of the complexity of managing all of these users. It also comes with Active Directory integration and business hours phone support. The price for this version is $180 per user for an annual subscription. For smaller businesses with one to ten users, Microsoft is now offering a new plan for $150 per user per year that mostly focuses on email, calendaring video conferencing and website tools. Yammer, which Microsoft acquired last year, is now part of the Office 365 for Enterprise edition, but Gregerson noted that the company isn’t making any specific announcements about how and if it plans to add the service to other versions as well. 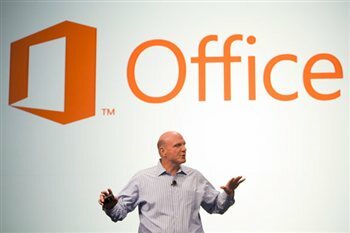 According to Microsoft, Office 365 is “one of the fastest growing businesses in Microsoft history. After only 18 months, one in five of Microsoft’s enterprise customers now has the paid service, up from one in seven a year ago.” Among small and medium businesses, Office 365 is also getting traction and the number of companies using it increased 150% in the past 12 months. The Hamburg Port Authority, the City of Chicago, Meals on Wheels, Toyota, beauty retailer Sephora and Sweden-based property development company Midroc Europe just switched to Office 365, for example. The new version of Office 365 for businesses is now available in 69 markets and 17 languages. It will launch in an additional 20 markets and 16 languages in the second quarter of this year. Office 365 ProPlus – Office 365 ProPlus includes the latest and most complete set of fully featured, rich Office applications delivered as a service: Word, Excel, PowerPoint, OneNote, Outlook, Publisher, InfoPath, Access and Lync. It works on up to five devices, including Windows-based tablets and PCs. People can now simply sign in to Office 365 from any of their devices, and their documents and personalized settings roam with them, allowing them to quickly pick up right where they left off. IT departments also get the controls they need including the ability to run Office 365 ProPlus side-by-side with other versions of Office, and tools to streamline and manage updates for their users. Office 365 ProPlus is available as a standalone offering for $144 per user per year or is included with the updated premium Office 365 Enterprise offerings and the new Office 365 Midsize Business. Office 365 Midsize Business – designed for medium-sized businesses with 10 to 250 employees. This service includes Office 365 ProPlus and provides midsize businesses with enterprise-quality communication and collaboration with Exchange Online, Lync Online and SharePoint Online – along with the simplified IT tools they need to maintain control while reducing complexity. Active Directory integration, a web-based administration console and business hours phone support are also included. Pricing is $180 per user for an annual subscription, the equivalent of $15 per user per month. Office 365 Small Business Premium – designed for small businesses with 1 to 10 employees. In addition to the complete set of rich Office applications, this service includes business grade email, shared calendars, website tools and HD video conferencing in an easy to manage service that doesn’t require IT expertise. Pricing is $150 per user for an annual subscription, the equivalent of $12.50 per user per month.